Enjoy a guided meditation while relaxing in a supported reclined position, traditionally referred to as “yoga nidra” or yogic sleep. 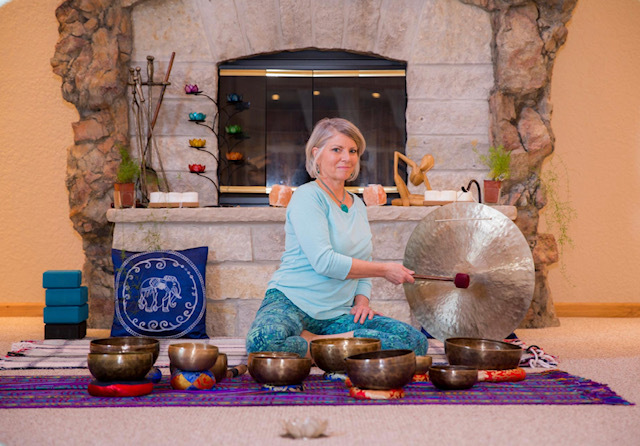 This deep meditative practice will leave you feeling relaxed and open, The gong will be played to reduce stress, slow respiration and lower heart rate. Your entire body will be fine tuned to a state of balance, consciousness expanded and awareness heightened. 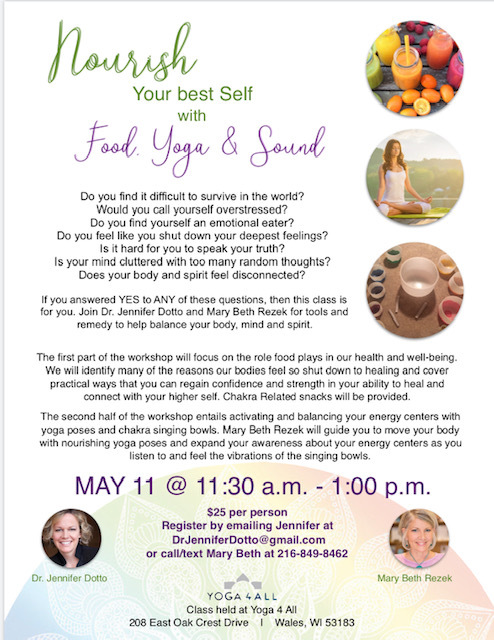 For the Ultimate yoga experience, join Mary Beth’s Yoga for Deep Relaxation class from 5:30-6:45 pm for $15 or use your studio class pass. We are honored to welcome Nancy Nesyto-Freske, Certified Clinical Somatic Educator and Yoga Therapist, back to the studio! She will continue to develop our awareness and understanding of Somatic Movements to relieve pain and stiffness. 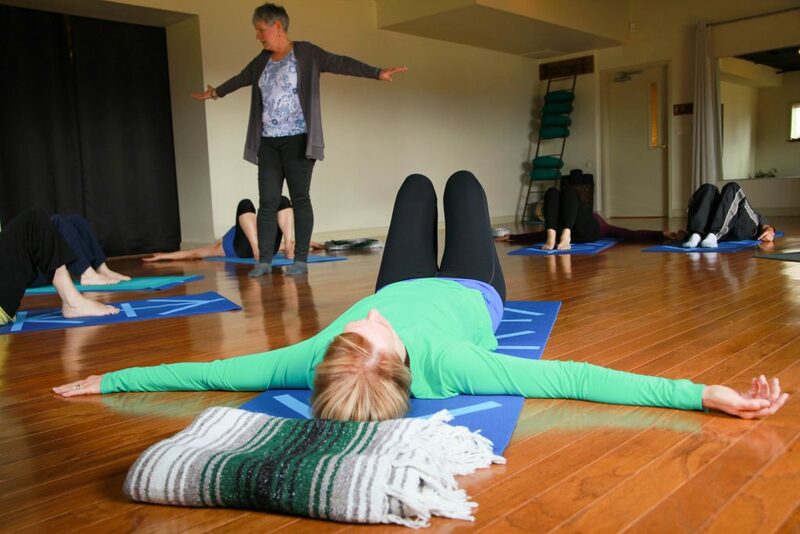 In this workshop, Nancy is going to focus on freeing up the hips and shoulders through a series of simple, gentle, yet profound Somatic movements. The result? Your body will experience what it feels like to walk with ease and reach without pain. For some, this will be the first time in years these areas of the body will feel alive! You will also receive a handout of the movements practiced so you can continue to improve the health of your hips and shoulders. No prior experience necessary. All movements are done laying on the floor. Trauma Center Trauma-Sensitive Yoga (TCTSY) is an intervention based on research from The Trauma Center in Boston, MA. TCTSY is an evidence-based adjunct treatment for complex trauma (sometimes called chronic, treatment-resistant Post Traumatic Stress Disorder) and is the only yoga-based practice accepted by SAMSHA and NREPP. offered. This weekend training qualifies as the prerequisite to apply for the 300-hour Trauma Center Trauma-Sensitive Yoga (TCTSY) Certification Program. Keri Sawyer is a licensed Trauma Center Trauma Sensitive Yoga (TCTSY) trainer and facilitator through the Center for Trauma and Embodiment in Boston, MA and is a 500 hour Yoga teacher in Alignment Yoga. Her main focus is to provide TCTSY to trauma survivors of all ages, train yoga teachers and clinicians in TCTSY, and also to provide research based information on TCTSY and trauma informed treatment to the therapeutic world. She currently facilitates TCTSY as an adjunctive treatment to pre-teens, adolescents, young adults, and adults who suffer from complex trauma and treatment resistant PTSD in clinical settings. She oversees the implementation of TCTSY into therapeutic models in select clinical and residential treatment programs across the country along with training and consultation for therapists, yoga teachers and health professionals. Keri provides informational sessions and 20 hour Trauma Center Trauma Sensitive Yoga trainings to agencies and communities. Her passion is to provide an opportunity for survivors of trauma to have an authentic present moment experience with a safe and predictable felt sense of their body so they can connect with themselves and others.